IPOPI is proud to announce the launch of a new website section dedicated to newborn screening for Severe Combined Immunodeficiencies (NBS for SCID). This new page compiles IPOPI advocacy activities for SCID NBS, the latest news on SCID newborn screening and our NMOs’ campaigns to ensure that this paediatric emergency is included in the national newborn screening panels throughout the world. For the first time, a map collects graphically information on the status of newborn screening in different countries in the different continents. You just need to select a country and information will be displayed regarding the existence of any activity regarding SCID newborn screening at national or regional level, a link for further information as well as information on whether there is any screening for rare diseases in that country available. 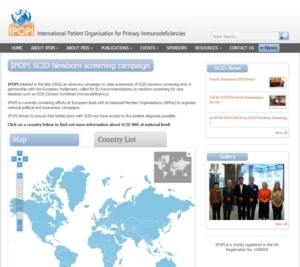 This new website page also provides information on IPOPI European and national campaigns on SCID newborn screening. Member organisations’ news are also portrayed in the website, so if you are leading a campaign in your country or region, please let us know! This website can only be possible if you contribute! So if you would like to share any update with us, please inform Leire.